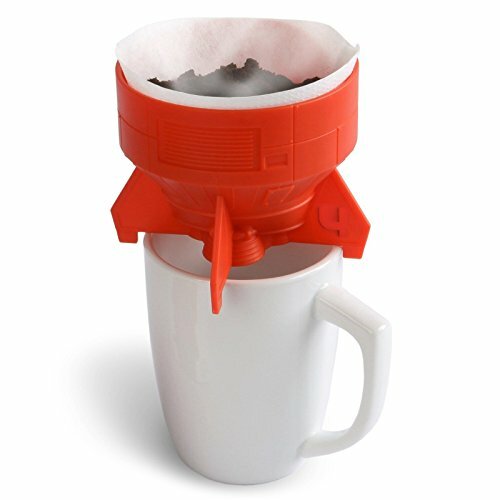 Rocket Fuel Pour Over Coffee Brewer - Moar Stuff - You don't need it but you know you want it. Do you need a boost in the morning to get started? Do you like rockets? Is coffee a vital part of your morning routine? Well, then you should really like the Rocket Fuel Pour Over Coffee Brewer. Made of BPA-free plastic, this single-serve pour over coffee brewer is a practical and humorous way to achieve liftoff in the morning. Cleanup is much easier than what Space-X has to go through. They have to completely refurbish the rocket after each launch. All you have to do is drop the Rocket Fuel Pour Over Coffee Brewer in the dishwasher. Dimensions: Approximately 4 x 4 inches. Uses standard #2 coffee filters. Fits cups up to 3.5″ across.